Plants 1.5--9 dm. Roots radiating from apex of corm; corm to 8 cm diam. 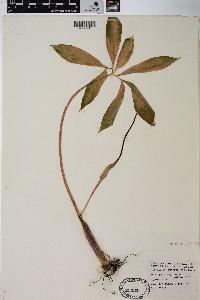 Leaves usually solitary; petiole medium green or purple-marked; blade pedately divided, leaflets (5--)7--13(--21), sessile or petiolulate, elliptic to oblanceolate, to 28 ´ 10 cm, apex acute to acuminate; central leaflet usually shorter than neighboring ones, these leaflets longest, outer progressively smaller. Inflorescences: s Spathe light green, sometimes marked with purple, convolute, 3--6(--12) cm; blade usually scarcely distinguished from tube; . sSpadix 6--20 cm (or longer), longer than spathe, apex tapering in long slender appendage to 15 cm. Staminate flowers with 2--4 stamens. Fruits oblong or pear-shaped, 7--13 mm. Seeds 1--2(--6), 3--5 mm diam. 2n = 28, 56. Flowering late winter (southern part of range)--late spring. Mesic to wet deciduous woods, thickets, and bottoms; 30--1200 m; Ont., Que. ; Ala., Ark., Conn., Del., D.C., Fla., Ga., Ill., Ind., Iowa, Kans., Ky., La., Md., Mass., Mich., Minn., Miss., Mo., Nebr., N.J., N.Y., N.C., Ohio, Okla., Pa., S.C., Tenn., Tex., Vt., Va., W.Va., Wis.; e Mexico. Reports of Arisaema dracontium occurring in New Hampshire and Rhode Island have not been substantiated by specimens. 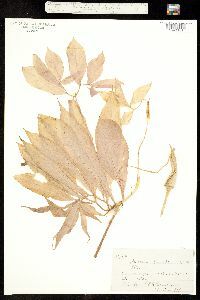 The species has also been reported from Nuevo León and Veracruz, Mexico (E. Matuda 1954); more study is needed to determine if these plants are conspecific. 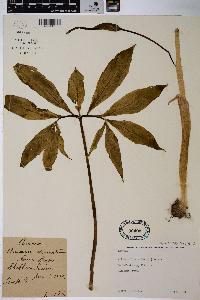 Specimens with a wider spathe blade than is typical in A. dracontium have been collected in Florida and Georgia, and these forms may represent intermediates between A. dracontium and the Mexican species A. macrospathum Bentham, which has an expanded spathe blade. D. G. Huttleston (1953) treated A. macrospathum as a subspecies of A. dracontium in his dissertation, but this change in taxonomic status was never formally published. Perennial herb 15 cm - 0.9 m tall Leaves: usually solitary, long-stalked, divided into two segments with a total of five to fifteen leaflets. The leaflets are more or less stalkless, to 28 cm long, to 10 cm wide, elliptic to narrow and inversely egg-shaped, tapering to a slender tip, and sometimes fusing near the base. Inflorescence: of many tiny flowers borne tightly clustered on the bottom half of a spike with a very fleshy axis (spadix), with male flowers above female flowers. The spadix is 6 - 20 cm long with a tip tapering to a narrow appendage reaching 15 cm long. A leaf-like sheath (spathe) surrounding the inflorescence is light green (sometimes with purple marks), 3 - 6 cm long, narrow oblong with a pointed tip, and rolled up longitudinally. Fruit: a cluster of orangish red berries, eacn berry 7 - 13 mm, oblong to pear-shaped, usually with one to three seeds reaching 3 - 5 mm across. Similar species: Arisaema species have compound leaves as well as flowers that only cover the bottom half of the spadix. Arisaema triphyllum is distingushed from Arisaema dracontium by having three leaflets and a blunt-tipped spadix that is shorter than the arching spathe. Habitat and ecology: Occasional in mesic to wet woodlands, often in floodplains and near springs. Etymology: Arisaema comes from the Greek words aron, meaning Arum, and haima, meaning blood, referring to the blotchy red leaf color of some species. Dracontium means dragon-like. More or less frequent throughout the state, growing in the shade in moist, rich soil.